Berry was in when you telephoned. He went as far from the telephone as he could, but even so, I did not enjoy the talk with you as I would have had I been entirely alone—and, something, perhaps, the weather, it is very heavy and rainy here, made the connection poor, so I could barely hear you. Three letters from me in one day! Never, never, charge me again with being indifferent! The very best you have done was one lone letter. I don’t mean by this to say that my affection is as three to one, but I will say it could not be more devoted, or more lasting—That is lots better than a comparison. Darling, a thousand thanks for calling me this afternoon. I was so happy to hear your voice—and to know that you were back safely. I am planning to go up to New York Friday afternoon at four. p. m. Directly after a meeting of the board of the Emergency Hospital. I am anxious to see you, sweetheart, about many things, and, oh! so very anxious just to see you, my dearest. Yes, I am sorry than I cannot stay with you—but I am coming anyway. The days drag without you. I need you in a thousand ways, and love you more. We may be able to go down to Elberon to see how the cottage looks. I am so glad you are pleased with the picture. Of course, I would not want to go without you; but we will talk it all over when I arrive. But, I hope we can arrange to go. Sweetheart, we had company for dinner—a Doctor Baker—and some gentlemen from Chicago attending the National Chamber of Commerce, called on me—I met them in Chicago last week—and I am due at the hospital at nine, so this is a very hurried incomplete letter, but nevertheless, is the bearer of loads of love for the only girl I have ever loved, or ever will. 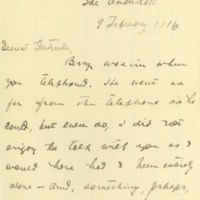 Grayson, Cary T. (Cary Travers), 1878-1938, “Cary T. Grayson to Alice Gertrude Gordon Grayson,” 1916 February 9, WWP20952, Cary T. Grayson Papers, Woodrow Wilson Presidential Library & Museum, Staunton, Virginia.